The United Kingdom, 1974: a time of the 3-Day Week, of snap-general elections and Glam Rock: a nation rocked as much by strikes and IRA bomb blasts as by Abba and Mud: a country in which overhung Sixties optimism was finally giving way to crisis-driven Seventies reality. Much the same could have been said of Ronnie Scott that year too. Indeed, when he and his band took to the stage of a tiny pub in the backwaters of Wiltshire on a spring evening in 1974, a one-night stop on an exhaustive nationwide tour, he was in the midst of perhaps the most turbulent time of his life. Amid fractious personal relationships and an ongoing battle with depression, and surrounded by a jazz scene whose very fabric had changed unrecognisably is a few short years, Scott nevertheless remained one of the UK's great jazz catalysts – a central figure around whom much of what was considered newsworthy within the idiom still concentrated. At forty-seven, the saxophonist was no longer chasing the music’s cutting edge; instead he had forged a style very much his own, one which tipped its hat to many of the good and the great who'd graced his own Soho club, but which now boasted even greater authority, maturity and individuality than ever before. And, despite his off-stage tribulations, he was happy with his band, a hitherto rare instance of a Scott-led line-up lasting more than a few years. Supported by organist Mike Carr and drummer Bobby Gein, he tore the roof off the White Hart, whose 'Jazz at The Icebox' presentations were a magnet for West Country jazz fans, probably unaware that what was undoubtedly just another night’s work for him and his hard-grafting colleagues was being caught on tape. Issued here for the first time, this recording captures Scott doing what he did best: playing no holds-barred jazz, minus the pressures that came from being a frontman for his own club, or acting as 'support act' to his many American guests. As such, it reveals a Ronnie Scott rarely heard on record, an instrumentalist in full-flow, sounding relaxed yet forthright, and making a mockery of the notion that art must mirror life. Scott may have been sailing stormy waters elsewhere but On A Clear Day finds him at the eye of a creative hurricane. “Ronnie is one of our finest jazz musicians and saxophonists – period”, wrote one Melody Maker reviewer that same year, a declaration fully born out on this album. 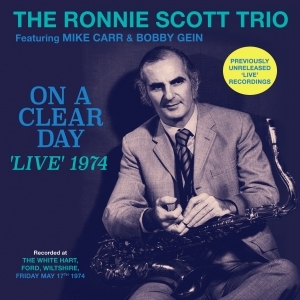 Packaged with period photos, reminiscences by some of those present on the night, and an in-depth booklet essay by award-winning saxophonist Simon Spillett, this album makes a powerful case for a long-overdue re-evaluation of Ronnie Scott, jazz musician, doubly so in featuring two rare examples for his oft-overlooked soprano saxophone work.